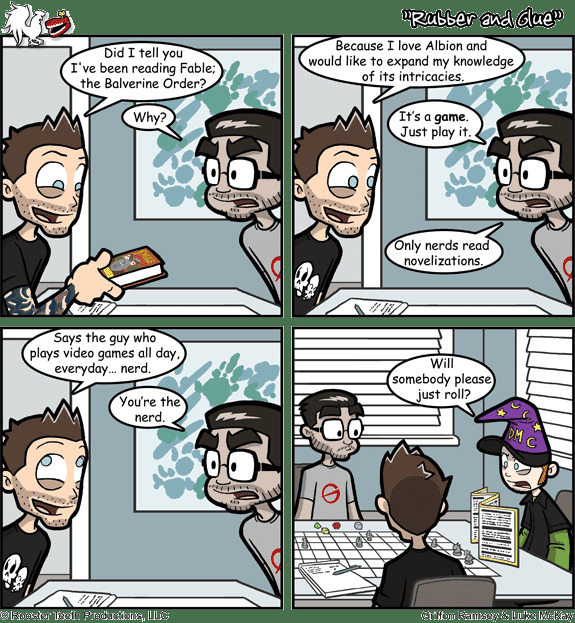 Its like the guys over at RvB were reading my mind when they wrote one of their latest comics. Check it out below. 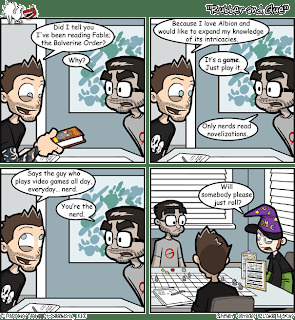 Dungeons & Dragons and Fable III combined into the same comic strip? That is something fantastic that could only happen if Bahamut and Avandra were smiling on me...if you get this, then kudos too you. Now there will be some of you that can't get the game yet, or just want to see what its like before you buy it. Thankfully there is ALREADY a Let's Play out for the game, and here it is. This is the first one I could find, and the rest of them will be linked on his youtube channel afterwards so check it out, if this is your bag. Need I say...spoilers, and if you want a totally open and rewarding experience, don't watch. We all love free stuff right? Well how about some free weapons for Fable III? Yes, ALREADY! Sounds pretty damn awesome so go and download now! So we know the game is coming out this week. And we know that there are loads and loads of awesome DLC to get with the game. There's also a book, and a controller to go with the awesome Fable-ness that we are getting. But how about a t-shirt like the one next to this chunk of text? What if you could wear one of the Reaver branded t-shirts while you get it on with the people of Albion and adventure on your road to power. 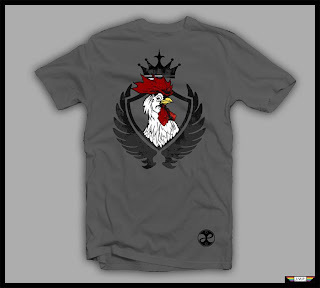 And this isn't the only t-shirt on sale by the kind folk from Lionhead. As you noticed in the marriage video below there is an awesome set of t-shirts to be owned by the public, and here they are below. Check out the fancy wears and be sure to get one before they become ebay property and are so sought after even Logan couldn't get his hands on one! Oh, and my Bard won't be doing any marrying...strictly wandering for the cleavage and coin my guy! Back in October 2004 Peter Molyneux and Lionhead Studios graced us with Fable. The revolutionary graphics, game play and a superb story making it a sure fire hit for the future of role playing games on Xbox. However after its initial hype and the honeymoon period, the game slowly slipped away, gamers feeling slightly let down by the shortness of the story and the ease of the game itself. Fable unfortunate suffrage from over-hype which led inevitably to the fans disappointment. However, a year on we have been given a second helping, a hope for role players everywhere, and most importantly a proper Fable. 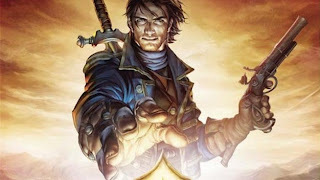 The new game, Fable: The Lost Chapters is seen by many as the Directors cut of Fable, the way it should have been if Lionhead hadn't been hindered by deadlines and release dates. It aims to set right the mistakes of the first game and in turn, win back its audience that were disappointed win the original. Thankfully, for me, and certainly the rest of the role playing community, the game has finally decided to deliver. The games main criticism was that the story in the first game was too short, lacking in plot and substance. Lost Chapters has solved this, Lionhead have added a whole new chapter to the game and expanded the storyline through the use of previously minor characters, as well as the more major ones. Quests have been moved in to fill the time in story gaps and the game now feels fuller because of it, making the world of Albion seem even more real. However the addition of new areas and the added story serve as only a small addition. The extra island takes no more than an hour to complete and lacks any staying power, the story also feels rushed and when you reach the admittedly breathtaking ending you are still waiting for more. The Graphics are still impressive in the Lost Chapters. The lush forest and tundra wastelands each have their own feeling of belonging. Also the smaller effects like grass blowing in the wind, and the running water, add extremely well to the world of Albion. The people of Albion are as before, beautifully sculpted and with distinct expressions and mannerism they are a joy to interact with. The voice acting is still great, each villager with his or her own voice, aided with a wide range of lines that mean you almost never here the same witty remake twice. Still within the game the choices you make, ultimately shape your appearance and your destiny. This is what sold the game to so many gamers last year and is what will undoubtedly sell the game this year as well. The many opportunities present themselves as complex moral decisions and are a joy to mull over. One quest sees you raiding a trader camp and having to decide whether or not to behead the last trader. Obviously this proves a difficult decision for the player, more money, or mercy? However the game can't rely on just this evil/good element and however much I love the moral choices, the lack of story and motivation really made my decisions. The game also boasts new spells and new weapons, and they do deliver. You get a whole two new spells that, although grand in style, are basically copies of themselves and add nothing to the overall feel of the game. The weapons feel just as redundant, coming at the end of the game, and offering less power than the ones you already have. They usually end up in your inventory, and are never seen again. This lack of a grand narrative and the small quest developments mean that Fable: Lost Chapters doesn't really feel like a role playing game. An example of this is in the limited movement by the character. You can enter a wood, and walk about, but you are seriously limited in your path. You are told to go one way, and one way only. This serves to simplify the game and means that you inevitably feel like you are being dragged along by the ear throughout the game, occasionally being let loose for a few minutes in a village or town. Fable: The Lost Chapters therefore serves more as a Action/Adventure with role playing elements, rather than a full blown RPG. The addition of Xbox Live has also been left out of the new version, and I can't help thinking that downloadable content would have seriously boosted the games lasting appeal. The regular download of quests and items that was so easily done with previous games like Knights of the Old Republic and Phantasy Star Online, added seriously to the games appeal, and if it had been done with Fable, it could have gone in a completely new direction. If you are looking for a simple, easy to play RPG and haven't played the first game, then Fable: The Lost Chapters is the game for you. 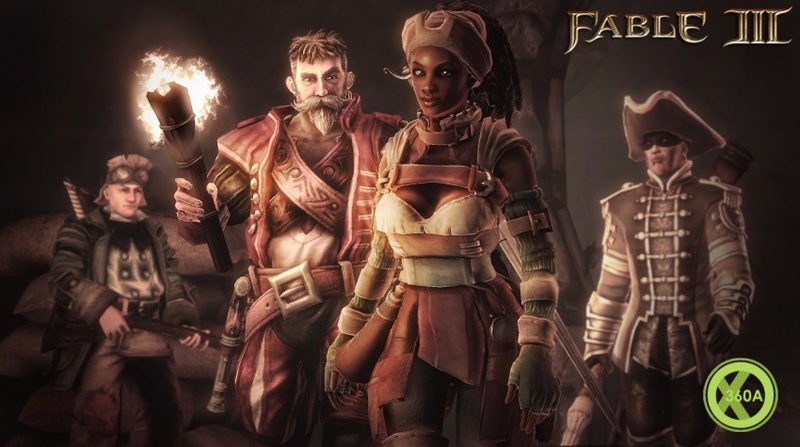 I am still a massive fan of the Fable games, and enjoyed playing them immensely, but was put off by the lack of story and development. If you are looking for a RPG that brings you in deep and makes you miss work for the next month, then this isn't for you. Thanks to FableFan101 for this fantastic little video from Gamespot hosted on his youtube channel. The game is only a few days away, and here is the first hour of the game and hopefully you guys will enjoy watching the videos below. Enjoy people, enjoy...and check out his channel below. 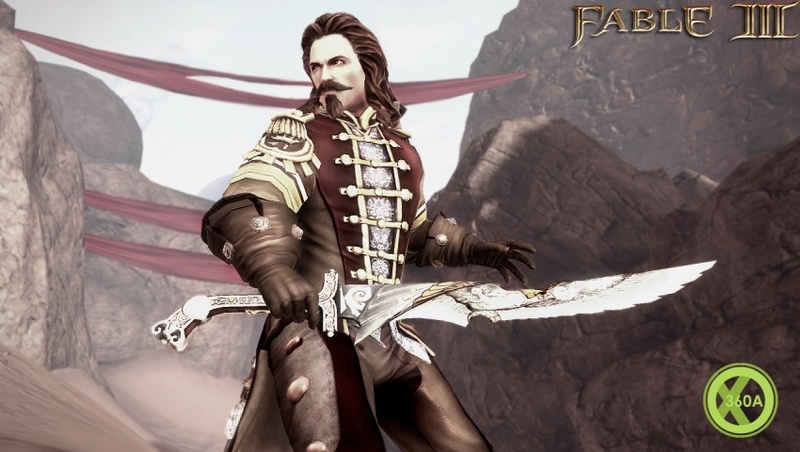 Following what is quickly becoming an industry standard, Microsoft will be including a code in launch copies of Fable III that gives early adopters a crack at some exclusive launch day DLC, including new outfits, a new skin for your dog, and some intriguing potions. Picking up Fable III at launch? Let us know what you think about the new DLC in the comments below! Sounds pretty good, and lets hope that I can get my hands on this before its too late! No I haven't lost my mind. 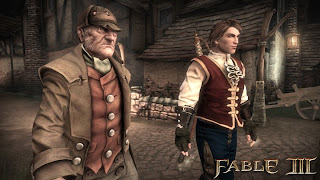 But the new lot of screenshots I just dug out should make you think about how awesome Fable III is going to be...Yes, above me here is an interesting picture of a fellow that looks a lot like Scotland Yards finest sleuth, the masterful Sherlock Holmes. Now of course he won't be in the game, but this does look rather interesting doesn't it? Now I love those horns, and the evil looks oh so good and evil this time around. Maybe I will quickly run through Fable II as an evil son of a chicken after all and make Albion a very dark place to live indeed. 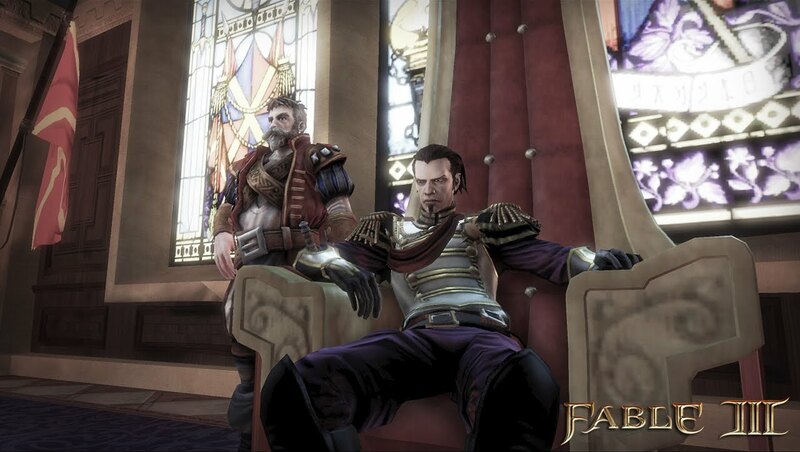 Now we all love a good Fable game, and we have seen the game progress from Fable I all the way now to Fable III. BUT, what if we took a step back in the world of Fable to the era of Swords and Sorcery in the 2D world? This is an early development video of a fan-made Fable game, using 2D retro styled graphics. ...will be great to see how this develops and changes! Check out his website above for more details on the game and how its shaping up. Thanks to IGN for this awesome new trailer/look into the game world of Albion and what is to come for all us budding Albionites! 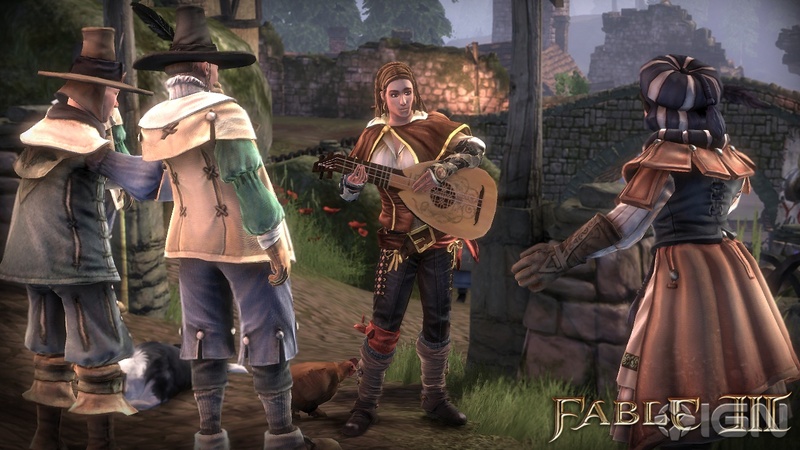 The previous Fable soundtracks have always been a blast to listen too, and this latest one proves to be just as good. 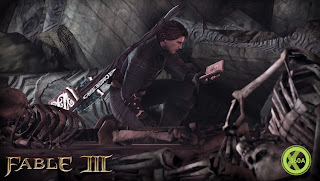 New York – October 11th, 2010 – Sumthing Else Music Works, Inc proudly presents the Fable III Original Soundtrack featuring the original music score from the latest installment to the action-packed and critically acclaimed role-playing video game franchise for Xbox 360. 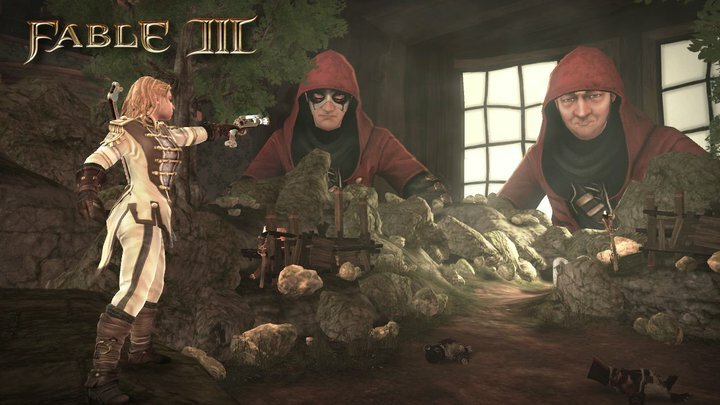 Fable III Original Soundtrack will be released on October 26th, 2010 to retail outlets through Sumthing Else Music Works Sumthing.com, and for digital download at SumthingDigital.com, Amazon MP3, iTunes® and other digital music sites. Fable III Original Soundtrack features the rich and musically diverse music score composed by BAFTA nominated series composer Russell Shaw. The Fable III score was recorded with the Slovak National Symphony Orchestra and 40-piece choir at the Slovak Radio Concert Hall in Bratislava and features solo vocal performances by international singing star Tanja Tzarovska. The soundtrack was mixed at Pinewood Film Studios, UK. 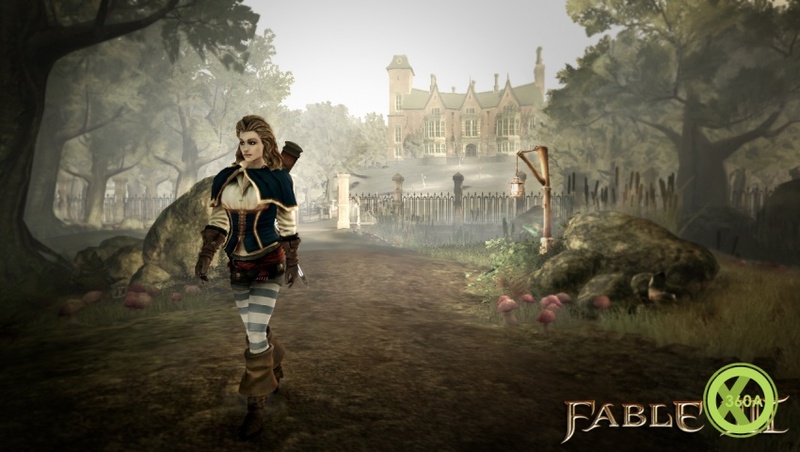 Fable III is the latest installment to the action-packed and critically acclaimed Xbox 360 exclusive franchise that has sold more than six million copies. In Fable III, you will be called upon to rally and fight alongside your people, ascend to the seat of power and experience the true meaning of love and loss while defending your throne. In your quest to seize power and defend your kingdom, the choices you make will change the world around you for the greater good or your own personal gain. Who will you become? A rebel without a cause, the tyrant you rebelled against, or the greatest ruler to ever live? 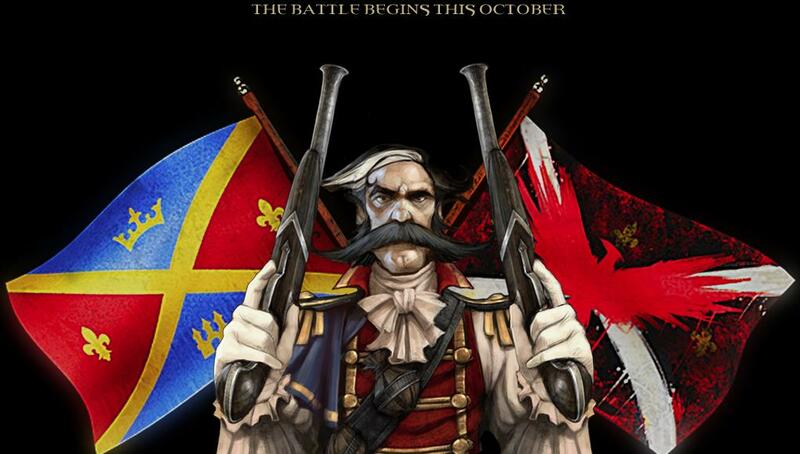 The Fable III Soundtrack will be release on the same day as the game, 26th October! So you can't order it yet but for now you can pre-order the game by clicking 'order now'. Sounds kinda awesome doesn't it? Can't wait to here those awesome tunes and get them playing alongside my in-game shenanigans! So we love to see game developers go that extra mile when it comes to their video games, so when Lionhead went and made a freckin house...what could we say but awesome! Check it out here, and also see the article linked below. Also has some snazzy signatures that you can use for the upcoming Kingmaker series of mobile games! Some new screenshots of Fable III showing off the nice and warm side of Albion, well with a big nasty angry man in the middle of them as well to spice things up. Sure looks like we'll be enjoying our relationships this time in Fable III, just hopefully not in the same way Mr Tv Fable did with his missus and the chicken! And I spy a bit of bardic loving going on there too! Wayhay! And those evil wings were so worth it.. Some new trailers, action from the Fable III media circus, with a new look into the world of Albion and its nuances, as well as a little retrospective on the Fable games so far. Guildford, 1st October – Microsoft today announced it will launch “Fable III: Kingmaker,” an innovative geo-location mobile gaming experience which will invite “Fable III” fans across Europe into a virtual land grab of epic proportions, all in the name of gold. Whether you’re a Rebel looking to fight for the people of Albion against the tyranny of your wayward King, or a loyal Royal follower, then sign up to take part on www.Fable3Kingmaker.com and get started. Players can take ownership of land for their faction using “Fable III: Kingmaker” mobile application staking a claim to unclaimed or opposing team’s territory by tagging their location and planting a virtual flag using the GPS facility on their smart phone. 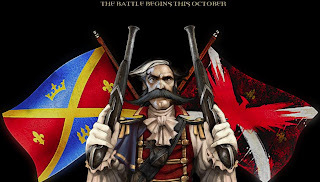 The faction with the greatest number of flags in any given territory at any given time will “conquer” that land – changing it in colour and following to either the Rebels or the Royals. 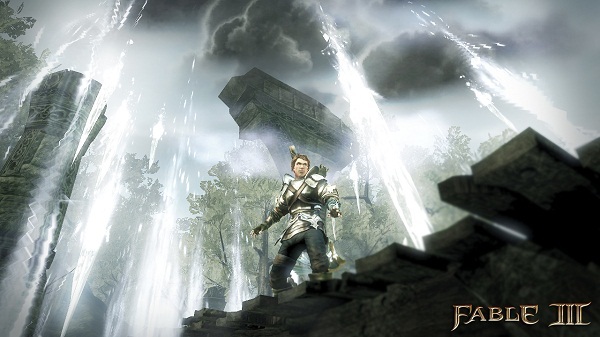 Players will be rewarded for their allegiance and efforts in capturing territory with in-game “Gold” which may be transferred into the full game of “Fable III” on Xbox 360* when it launches across Europe on 29th October. The “Gold” can be spent on player customisation and in-game products, from crystal swords to manor houses, giving fans of “Fable III” the chance to build up their bank account and get a head start on their friends before the game even hits the shelves later this month. And for those already plotting their road to rule, there will be the opportunity to claim chests full of additional in-game “Gold” from designated locations scattered across the map. 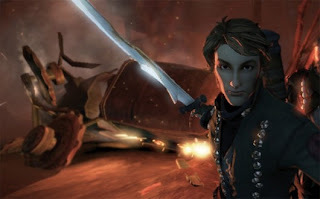 Peter Molyneux, Creative Director, Microsoft Games Studios Europe, comments, “To be able to earn gold you can use in your Fable III game, and to check-in and claim land for your side is brilliant for both Fable III and Xbox 360. We all love the innovation and feeling of being connected that Kingmaker brings to gamers. 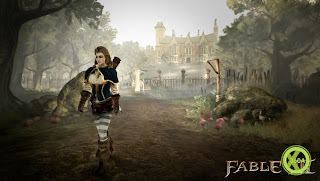 Chris Lewis, Vice President, Interactive Entertainment Business, Microsoft EMEA, comments, “Fable III: Kingmaker brings gaming out of the home and turns your town or city into the setting for an epic online battle. We are always challenging ourselves to find new, exciting ways to deliver second-to-none gaming experiences and we can’t wait to see Fable fans take to the streets across Europe with Fable III: Kingmaker. Available in the UK, France, Germany, Spain, Italy, Netherlands and Sweden - “Fable III: Kingmaker” will be available on Windows Phone 7: the only phone that lets you play games with Xbox LIVE - when it’s released across Europe this holiday. From Monday 4th October it will roll out on a number of operating platforms as a free application download* on over 60 devices***. 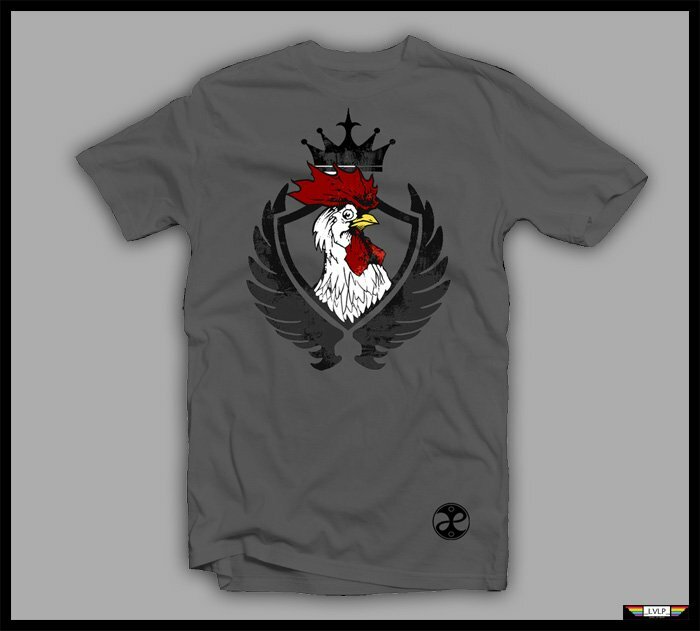 For more information on smart phone compatibility, please visit www.Fable3Kingmaker.com. 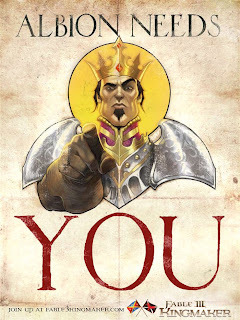 The Kingmaker mobile game will be pretty damn awesome and get Fable out there to the streets of your home town, will you support the rebels against tyranny or will you be a loyalist fighting to preserve the crown?